Our range of luxury wooden dog beds are all handmade to order for us here in Britain. The beds can be personalised with your dog's name for that little extra touch and you can even choose a bespoke paint colour for your bed so that it matches your home decor. These raised wooden dog beds prevent drafts and create a better airflow around the bed which will reduce odours. These fabulous dog beds look fantastic in kitchens, living rooms and bedrooms. 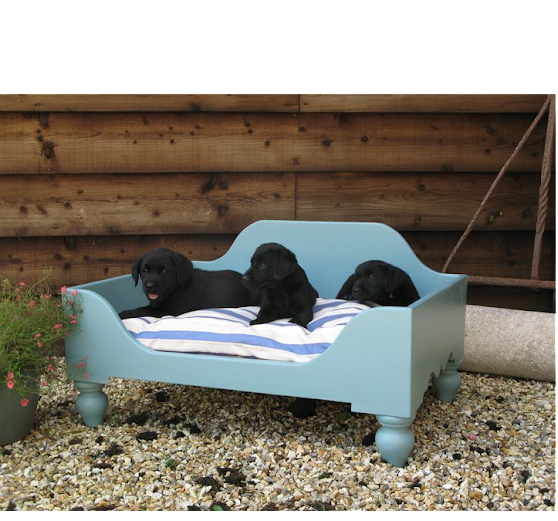 A popular choice for country homes, our luxury raised wooden dog beds are all hand made to order for us in the UK. Raised dog beds lift your dog from sleeping on the floor so avoid draughts and many breeds of dog like to step up into a bed especially our little King Charles Cavaliers. Some of our wooden dog beds can be covered in a selection of fabrics including suede, faux leather or luscious crushed velvet. On these dog beds we can also embroider your dog’s name onto the front of the bed for that extra personal touch. If this is all a bit much for you and your want something simple and classic, why not choose a paint colour that matches your home décor or we can paint your wooden dog bed in any bespoke paint colour. Our classic raised wooden dog beds can also be personalised with cut-out wooden letters attached to the front of the bed and painted in the same or contrasting paint colour of your choice.